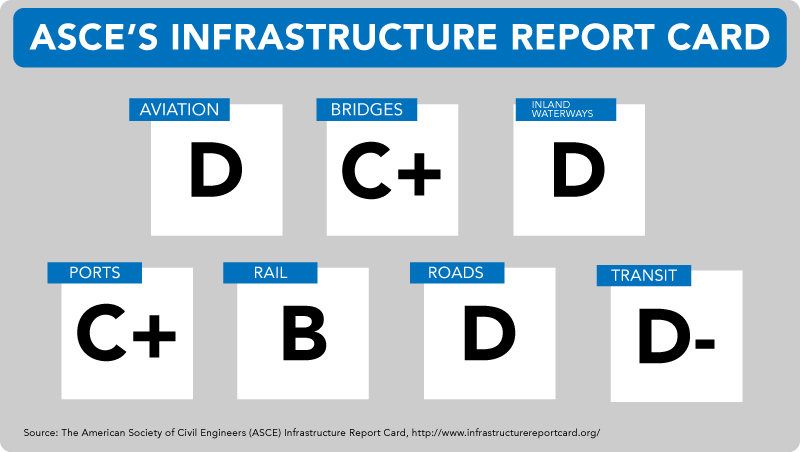 Today, the American Society of Civil Engineers (ASCE) released its latest Infrastructure Report Card, a periodic assessment of the condition of our nation’s infrastructure system, including roads, bridges, waterways, railways, public transit, and more. The latest findings are a striking confirmation of what we already know: America’s infrastructure is in desperate need of repair. The report card grades our nation’s infrastructure as a D+ overall, and the study’s scores by category echo the same troubling refrain: America is barely passing. Some elements of the system were found to have made slight progress, including the rail sector, which was rated a B thanks to a marked increase in private sector investment by the rail industry. This is heartening, but still, a few key categories experienced decline, and several remained unchanged from the last analysis four years ago. Simply put, these aren’t the kind of marks anyone is going to be posting on the refrigerator. These low scores follow a pattern of decay over decades, and they’re troubling for a number of reasons, not least of which is the fact that America’s infrastructure is the backbone of our economy. Businesses of every shape and size – and the employees that make them tick – rely on our airports, our interstate highway system, and our waterways each and every day as they move their products and serve their customers. Congestion at airports makes travel a headache for business and leisure travelers alike, all of whom drive economic activity. Poor roads and railroads wear on the trucks and trains we rely on to carry goods across the country, reducing capacity and slowing the pace of the deliveries we eagerly await at our doorstep. Crowded ports delay shipments from making their way onshore and being linked to the next step in the supply chain. When you think about it this way, “infrastructure” is a far-reaching concept. The ASCE assigns grades in 16 categories, but no matter how you slice it, one thing is for certain: The sum of the parts is the lifeblood of American growth, success, and prosperity. The challenges facing our nation’s aging infrastructure system are significant, but they are not insurmountable. The Trump administration has been vocal about the task at hand, affirming the need to rebuild and modernize our infrastructure. Congress has also indicated its willingness to get to work on a fix. These are all promising indicators. It’s time for our leaders in Washington to take charge and tackle the problem for good. For years, the Chamber has supported meaningful action to reinforce our one-of-a-kind infrastructure system, and we have a slate of potential solutions to prove it. Then comes the tough part: In order to turn those ideas into action, we need to invest. So how do we pay for it? Over the last few weeks, policymakers have offered various answers, including direct federal funding, revolving loan programs, tax-preferred financing, and public-private partnerships. Just yesterday on the Hill, we laid out the business community’s perspective on the question. Our answer is this: All of these options should be on the table. Any infrastructure package should make use of a variety of funding and financing options to increase our investment, but at the end of the day, a long-term, sustainable funding source should no doubt serve as the anchor. America’s latest grades on infrastructure are alarming, to be sure, but it is a reminder of the urgent need for action to rebuild and restore the system upon which our economy thrives. The attention being paid to this issue is encouraging, and we should to seize this moment of consensus across political and industry lines. The time for infrastructure investment is now, and it is incumbent upon us all to devise a fix soon that better serves our nation’s businesses, workers, and customers. Ed Mortimer serves as vice president of Transportation and Infrastructure at the U.S. Chamber of Commerce.